This pint-size polishing tool goes where other tools can’t! 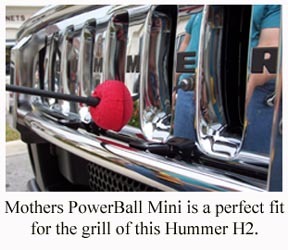 Mothers struck gold with their PowerBall and they’re doing it again with the PowerBall Mini! This 3 inch version of the original is ideally sized for the small openings and deep recesses found on many vehicles. 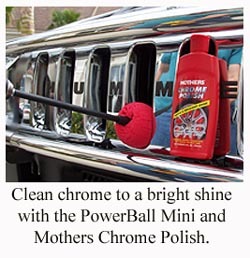 Pinpoint polishing is now possible with Mothers PowerBall Mini! Like its big brother, the PowerBall Mini features professional grade, closed-cell foam tabs that gently but effectively polish surfaces that you previously had to polish by hand. The foam is safe on metal, plastic, fiberglass, and glass. The foam tabs are designed to be both sturdy and flexible. The can easily pass over small protrusions without ripping. The foam ball maintains its shape as you polish so there is always a cushion between the ball’s center post and the surface being polished. Another huge bonus with the PowerBall Mini is the 10” long extension rod included with the ball. The extension is ruggedly built with an integrated sleeve that allows for excellent control and grip as you polish. There’s nothing flimsy about it! Reach into deep-set wheels and clean between spokes with ease. Because the Mothers PowerBall Mini is completely round, it goes where other polishing pads can’t, like between spokes or between motorcycle components. When you position the ball between two surfaces, it cleans both sides at the same time, which saves you time. It’s the perfect tool to clean and shine concave, recessed, or otherwise hard-to-reach areas. The foam ball is made to be used with an electric drill. The ball features a drill bit that inserts into the drill. 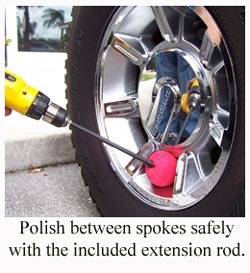 To attach the extension rod to the ball, remove this drill bit and screw on the extension. The extension has its own drill bit. Operate the ball clockwise and start polishing! Mothers PowerBall Mini has endless uses. Clean and polish plastic headlight lenses, diamond plate, all kinds of wheels, uncoated motorcycle windscreens, metal pipes, boat windshields, convertible top windows, and much more. Pair the ball with Mothers California Gold Metal Polish for wheels, and Mothers Plastic Polish cleans and renews plastic. When the PowerBall Mini becomes dirty, soak it for 15 minutes in a mixture of McKee's 37 Polishing Pad Rejuvenator and water (1 scoop to 3-4 gallons). Rinse well and air dry. If you liked Mothers PowerBall, you’ll love the Mini! With the same high quality foam and reversible design plus a 10” extension rod, Mothers PowerBall Mini will take you places a polisher has never been! I detail motorcycles and cars and for certain applications, This product is a life saver. Borrowed one of these balls from a friend and used it to do my Motorcycle Aluminum wheels. Great gadget! Worked well and made the job a snap! Going out to get my own! The perfect companion to the original Powerball. It can get into much smaller areas and with today's wheels that is a must.